Ex-Hibs boss Alan Stubbs has lifted the lid on his frosty relationship with former rival Mark Warburton. 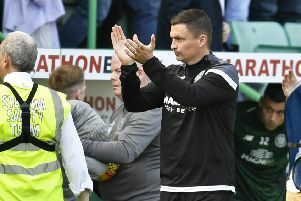 The two men battled for both the Scottish Championship and Scottish Cup trophies during Stubbs’ second and final season at Easter Road. Though Rangers would eventually pull away in the title race, Hibs had the last word when David Gray’s injury-time goal ended their 114-year wait for a Scottish Cup final victory. Across the course of that season, Stubbs and the then-Rangers manager had taken jabs at each other in the national press. The 46-year-old now admits that the acrimony started before the season had begun, when Rangers tried in vain to sign reigning Championship Player of the Year Scott Allan. Stubbs told Simon Ferry’s Open Goal show: “Mark seemed to take the bait a little bit with me on a few occasions. So I thought if he’s going to take it, I might as well just carry it on a little bit. He didn’t like me referencing the budget on occasions. “Probably the bit that started it was earlier on in the season with Scott Allan, when they tried to come in for him. “I rang Mark personally and spoke to him about it, and said ‘listen, it ain’t happening, forget it’. “Mark tried to say he didn’t really know how the club was working and that it was upstairs it was coming from. That was Mark’s version of the events. It certainly wasn’t mine. “I said to him: ‘Out of respect, it ain’t happening. I can assure you. “‘I’ve spoken to the club and if Scott Allan leaves, I’ll be leaving. That’s how much I know for a fact it ain’t going to happen’. “They came back in and then they came back in again, which I thought was disrespectful. Hibs held firm on their insistence that Allan wouldn’t be sold to Rangers before accepting an offer from their Old Firm rivals Celtic. The midfielder recently returned to Easter Road on loan from the Ladbrokes Premiership leaders until the end of this season.